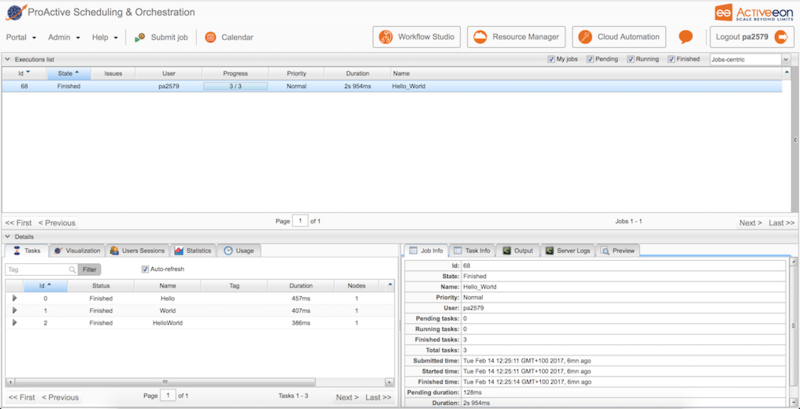 With ProActive, workflows are executed by the Scheduler as jobs made of tasks. A task is the smallest schedulable entity, it can be a script, a native executable or a Java class. In this tutorial we will create a simple job, submit it to the scheduler and monitor its execution. For each step, we show different ways to perform it, using different tools such as the Workflow Studio, the REST interface or the command line. We start with a sample job printing 'Hello World!'. The first two tasks simply return 'Hello' and 'World' and the third task prints the results of the previous tasks. 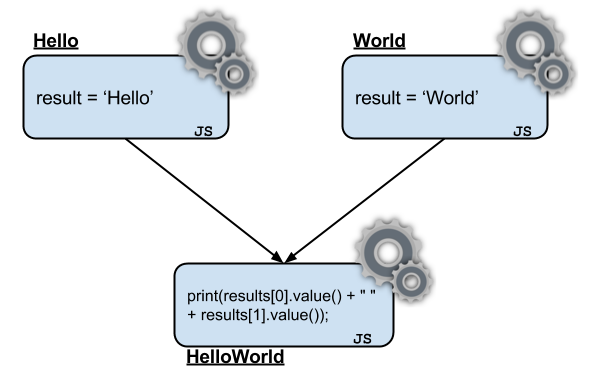 Here we introduce the notion of dependencies between tasks, the task 'Hello World' will only be executed after the tasks 'Hello' and 'World' are finished. Note that due to the parallel nature of ProActive, the execution order of 'Hello' and 'World' is not predictable and the job could output 'World Hello'. Of course, we could add more dependencies to prevent the parallel execution of the tasks. You can download the job in its XML format to submit in the next step or preview it. You can access the Studio at http://trydev.activeeon.com/studio. Now you can create dependencies so the task HelloWorld retrieves the results from the two other tasks. It is done by dragging links from one task to another. Jobs are written in XML using a custom grammar. Below you can see the XML written for the Hello World job. Upload the file then Submit! To submit a workflow from the Studio, simply click on the execute button and fill in your credentials that you received by email. ProActive exposes a REST API (actually also used by the web portals) that enables the user to submit jobs. Below is an example using cURL and Bash (make sure you replace the credentials with the ones you received by email. Then you can login with your credentials and you should be able to submit a job using the command submit and the path to the job as the argument. Select the job you submitted to view detailed information about the tasks, the output, the execution times, and more. 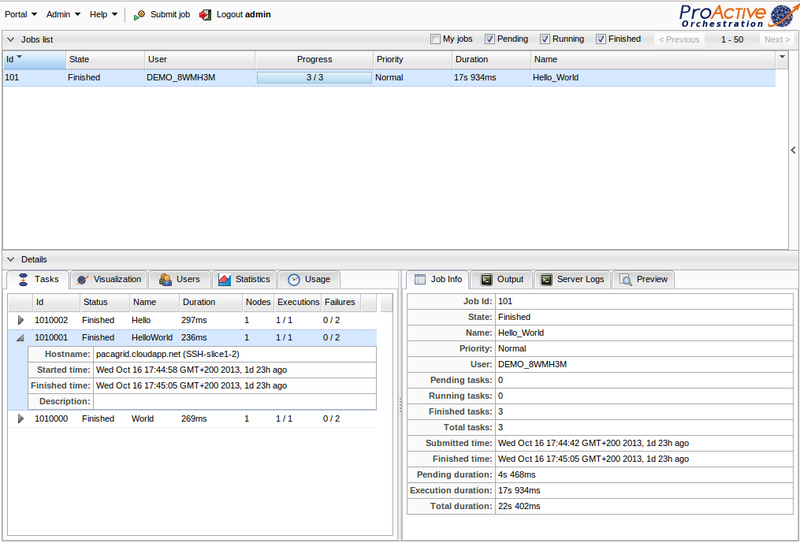 To see the resulting output of the job, go to the output panel, and click on the fetch button. Feel free to explore the REST API documentation to discover more functionality. You can use the help command (help()) to list all available commands.